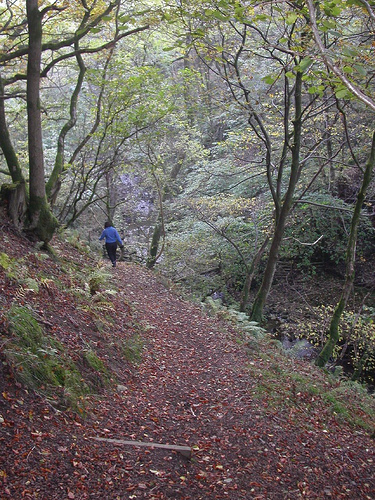 Located off the A683, 2 miles north east of Sedbergh, at Cautley, Cumbria, and close to Hebblethwaite Hall, Hebblethwaite Wood is one of over 1,000 woods across the UK cared for by the Woodland Trust. Ancient woodland flanks both sides of the Gill and continues up and down stream. The Woodland Trust acquired a 5 hectare section of the wood in 1990. This semi-natural ancient woodland, within the Yorkshire Dales National Park, is a continuous strip almost 1 km in length, varying in width from 20 to 80m. 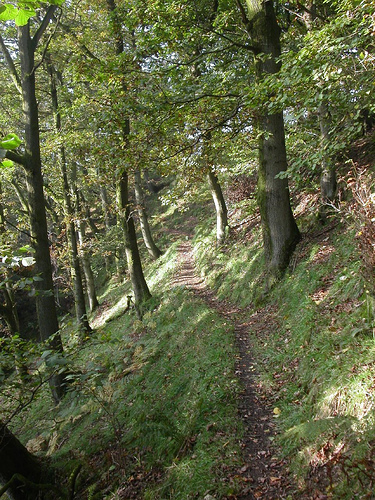 The woodland managed by the Trust follows the northern valley side of the deeply incised Hebblethwaite Hall Gill and is very steep in places. From the footpath, which runs the length of the wood, impressive views of the many small waterfalls created by the almost vertical bedding of carboniferous limestone, sandstone and shale, which outcrop at the base of the gill can be gained. These internally exposed complex rock and strata formations are designated by the Cumbria RIGS Group. The wood is almost hidden in the surrounding landscape, which is made up primarily of pasture and moorland edge. The wood supported a bobbin mill employing local people until about the 1890's, when it was abandoned. The buildings are to the east of the wood and fenced for safety. See Hebblethwaite Mill. Hebblethwaite Hall itself was a busy farming complex and probably used the wood for grazing and firewood. Wet flushes appear at various points in the wood and a number of small watercourses drain north to south. In these locations mosses, lichens, male ferns (Dryopteris filix-mas) and lesser celandine (Ranunculus ficaria) abound. In the relatively drier areas grasses, bluebells (Endymion non-scriptus), foxglove (Digitalis purpurea) and bracken (Pteridium aquilinium) are more dominant. Browsing by sheep, in the past has considerably reduced the floristic value of the wood. The wood canopy is almost continuous and any small clearings are restricted to the extreme ends of the site. The canopy species are predominantly oak (Quercus robur and Quercus petraea) and ash (Fraxinus excelsior) but also include some sycamore (Acer pseudoplatanus) and beech (Fagus sylvatica). In some locations there is a sub-canopy formed of hazel (Corylus avellana) and rowan (Sorbus aucuparia). Regeneration exists only in those locations where the ground is too precipitous to allow access by sheep in the recent past. Attempts have been made in the past to plant oaks and hazel in some small areas in the south of the site but these are heavily protected by tree-guards and only approximately 30% appear to be still alive (August 2002). Red squirrels were until recently resident in the woodland. Their current status is unknown. Local volunteers control grey squirrel within the area. The wood can be entered from the public right of way crossing the site north-south and then along the permissive paths through the woodland. Users can traverse the length of the wood but must return by the same route. The terrain is picturesque but in places steep making walking difficult. Management work to the extensive path network of over 650m, included the benching of paths and the provision of footbridges, and has done much to improve the ease of access. 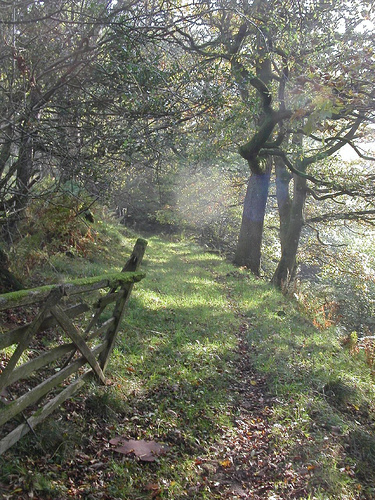 Hebblethwaite Hall Wood is designated ‘semi natural ancient woodland’. In England & Wales ancient woods are defined as those that have been continuously wooded since 1600 AD (Spencer & Kirby 1992). Generally semi-natural stands consist of predominantly native trees and shrubs and have not obviously been planted but have arisen from natural regeneration or coppice regrowth. At some time in the past sycamore and beech have been planted at Hebblethwaite. In the recent past the relative significance of beech and sycamore has been reduced and, although some specimens remain, the wood displays the characteristics of upland oak woodland with hazel coppice understorey. Regeneration is evident in the upper section of the wood but in the lower, section, which has suffered from sheep grazing in the past, intervention in the form of group planting was undertaken to establish succession. It is the Trust’s objective to manage this semi-natural ancient woodland in such a way that the landscape and conservation value of the site is maintained, as well as to increase people’s awareness and enjoyment of this ancient habitat. This is in line with the outcomes in the Trust's Action Plan Keeping Woodland Alive. 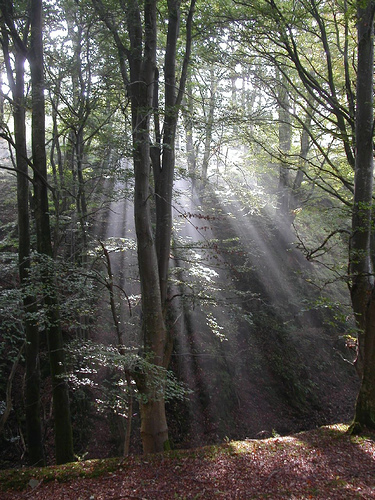 The Trust aims to maintain the overall high forest continuous-cover structure of this oakwood, whilst accepting and encouraging succession and the development of a naturally regenerating understorey; maintaining and enhancing the conditions in which the ancient woodland communities can flourish and become more robust. Thereby maintaining the variety and character of this ancient woodland and sustaining the landscape value of a continuously wooded system by adopting silvicultural techniques to promote maturity and uneven aged structure within the woodland. from a series entitled Our Special Wood by Adam Horan The Trust aims to enhance the biodiversity of the ancient woodland characteristics by conserving old growth both native and non-native, deadwood communities, mosses and lichens by adopting working practices that do not impact adversely on the integral environment; thereby protecting and promoting the ecology of the ancient woodland for all species. It will be important to ensure that the boundaries remain stock-proof and further monitoring will be necessary to ensure continuity of succession. Species regeneration and development of the understorey will be observed and management techniques to promote regeneration and succession will be employed if necessary. Non-native tree species within the woodland will be monitored and if an increased proportion is causing habitat change or threatening the loss of species control to maintain the current approximate proportion of 25% within the canopy will be considered. The Trust will maintain the informal access to the woodland on some 650m of permissive paths and provision of two entrances with welcome signs. Public access will be encouraged with paths, stiles and footbridges maintained and improved where necessary and open access encouraged so that local users and visitors can continue to share in the wood’s beauty, gain an understanding of the woodlands importance in the landscape and it’s rich wildlife habitat, which is irreplaceable and of the historical features intrinsic to the wood. Public information and promotion of the woodland both nationally through the Trusts publications and directory’s and locally will be enhanced where possible and posters will be used to inform and involve visitors with the woodland. A PDF copy of the Woodland Trust Management Plan for Hebblethwaite Wood can be viewed by clicking Here.